Perfect is in the eye of the beholder because “perfect” doesn’t exist except to the person who believes they are seeing, or who believes they have created, or who believes they are experiencing perfection. 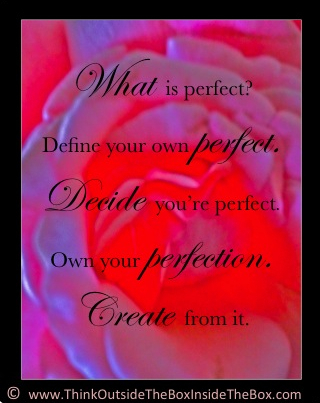 Perfect is whatever you decide it is! Don’t let someone else’s concept or idea of what perfection is influence you discovering, determining and creating your own vision of perfect. Don’t be a follower! Be a visionary. Create your own definition of perfect. And don’t let anyone tell you you’re wrong.